. . . is to bring quality education to children throughout the country with whatever educational resources best engage them and promote active learners. To that end, we provide engaging educational materials that allow all students to experience learning success and become life-long contributing members of our communities. We support educators, parents and students by offering learning resources that satisfy students with differentiated learning styles. This increases their academic success and reduces student dropout rates. Education leaders, Leaders of Nations, industrial leaders , and the wise ones will come forth as a joint force from all over the world to participate in eTAP to help ALL our children around the world to succeed. eTap 24X7 online personalized and adoptive student learning & teaching system that can help ALL the students from K1 to K12 to learn better, make learning painless, fun, resulting in better grades, saving time and cost efficient. 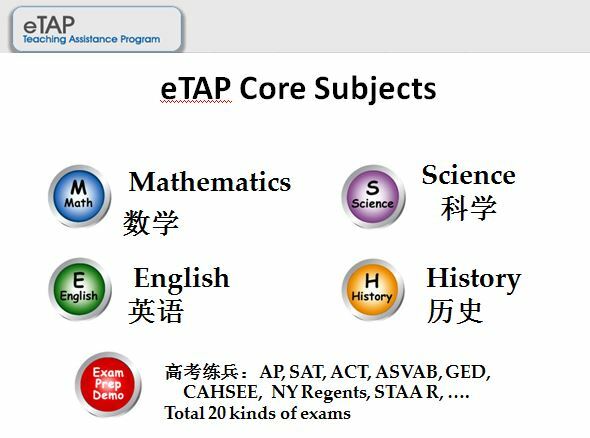 eTap system also enables teachers to teach from ready to go contents, using the features to generate individual auto score and test results, making it easy to monitor each student’s learning progress in detail. - We will Love to Hear from you!